To further encourage employee activities like these, in January 2017, Arrow’s global Corporate Social Responsibility team launched a new employee engagement portal, Arrow Charitable. This platform makes it easier for employees to get directly involved and rewarded for engaging proactively with their local communities. 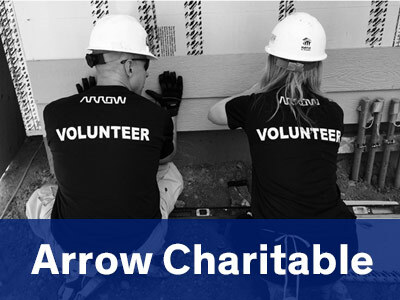 “Arrow Charitable makes it easy and rewarding for our employees to take an active role in helping make the world a better place. Arrow is always looking for innovative ways to support local communities, and this tool is making the important work of giving back even easier,” said Alex West, corporate social responsibility manager at Arrow. Grow the collaborative and innovative culture within Arrow and the communities where Arrow employees live and work. Continue to attract and retain the best and brightest talent. Facilitate an active and socially responsible voice in the communities where Arrow does business, and where its employees live. Assist employees in finding local volunteer opportunities, and recognize their team and individual volunteer efforts. Provide one, central location for employees to donate to charitable organizations, track their volunteer time and benefit from matching corporate grants. Through Arrow Charitable, it’s easy for employees to give money, time or both. Employees can donate directly to their favorite charitable causes or join select corporate matching campaigns via payroll deductions, credit card payments, PayPal or other electronic contribution methods. Employees who enjoy volunteering can log their time in Arrow Charitable’s “Dollars for Doers” program. The company will then provide a financial contribution based on how much time employees spend volunteering with the charity of their choice. This applies to both individuals and teams and to charity race/walk matches.